Researchers in Brazil have developed a test to spot counterfeit bottles of the national drink cachaça that have been artificially aged. The team from the State University of Campinas and Federal University of Minas Gerais used a mass spectrometry technique known as ESI-MS to identify samples of the sugarcane-based liquor that had been aged by the addition of dyes, sawdust or other contaminants. Counterfeiters add the ageing ingredients so they can pass off cachaça which has just been distilled - known as 'white' cachaça - as a much more expensive product that has been aged for one to two years in wooden barrels. The ageing process reduces the alcohol content in the liquor and leads to a smoother, more palatable drink as it also reduces acidic compounds formed during the fermentation process. 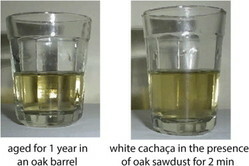 Under Brazilian law, cachaça sold as aged must undergo a period of at least one year in wooden barrels, and the use of any dyes, extracts or other colouring agents is prohibited. ESI-MS (direct infusion electrospray ionisation mass spectrometry) is already employed to classify alcoholic beverages, such as beer, wine, whisky and sake as it can be applied directly to samples without processing steps such as extraction or isolation. "The adulteration or counterfeiting of alcoholic beverages encompasses enormous economic damages to the legal producers and serious health threats to the consumers," according to the authors. A sampling study published in 2001 found that up to 50 per cent of alcoholic beverages sold in Brazil were counterfeit, they write in the journal Food Chemistry. The technique "provides a simple, fast and direct method to certify the origin and ageing of cachaça based on a diverse and hard to imitate set of diagnostic ions," they conclude. A market report published by Just-drinks.com last year revealed that Cachaça was the ninth-largest global spirits category at 82.67m nine-litre cases in 2011, almost entirely (98 per cent) sold into the domestic market. It has been widely tipped to grow into the next big international spirits category, the report suggested, following in the footsteps of rum and tequila.